Starting tomorrow, local Ford dealers are partnering with the Seattle Mariners and Northwest Harvest to collect peanut butter, one of the most needed items in local food banks. 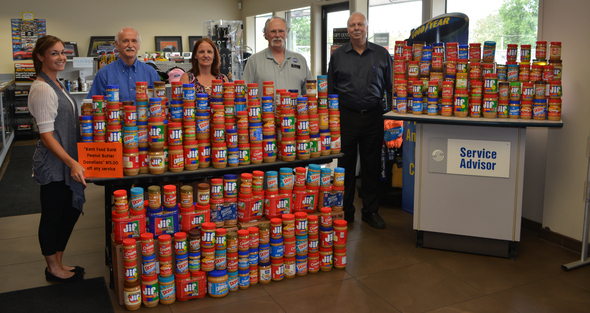 Local dealers are encouraging folks to bring new, unopened jars of peanut butter to their dealerships during the week and to the May 14 game against the Angels for the Mariner’s Peanut Butter Drive. Last year, more than 30,000 pounds of peanut butter were collected in the five-state Northwest region. This year Skippy has agreed to match all donations. If you want to help but aren’t able to participate, you can also donate online at www.FordFeedsKids.org and select the food bank of your choice to make a cash donation. Visit their website for hours of operation.